Goal number one is control of right notes, right sound, right intonation, right length, and right volume. Goal number two is to be able to be in shape at the time of the concert. First make individual notes familiar and bring them under control. Then go back and forth in interval work between two notes (or two notes of a study or solo) guarding against over-changing (collapsing) the lips and familiarizing yourself with the difference in the distance of lower teeth from upper. Then apply the above to all playing. Some things lips can do only themselves and other positions that the lips can take only with the help of the mouthpiece. Studies should be put together on the mouthpiece as well as playing each note separately. This also applies to scales. Demonstrate buzzing of lips alone (on a specific tone), then on the mouthpiece, and then on the horn. Play daily a C scale on the mouthpiece separating notes repeatedly and then the building of a connected mouthpiece scale (not slurred), keeping the muscular structure alert. The first downward scale (or any first notes) should arrange a solution for the problem of embouchure – diaphragm. Repeat many times pp (quite a few should be done getting emptier of air) so that support begins to come without overblowing and the consequent distension of the embouchure. Practice a daily routine that gets you around the instrument, but which doesn’t abuse the physical, which, instead, creates security and a feeling of control and doesn’t force you to indulge in bad habits of collapsed embouchure and excessive mouthpiece pressure. Sometimes in warm-up, when the effort is made to use good support, the blowing of air is neglected and more than desirable pressure is used on the lips. The important thing is to achieve a combination of both. Also the “blowing at the mouth” feeling is harder to feel on high notes when the pucker is less and the pressure greater. Make the connections between on-off practice and endurance; the obvious one is more moments of rest when playing on-off. The less obvious is that fatigue is caused by legitimate (acceptable) factors and by non-acceptable ones. On-off creates and finds the exact rightness for each note and helps therefore to eliminate fatigue because fatigue is caused by unsmooth production. The other valid reason for fatigue is pressure. This is more needed in the high register. Pressure is reduced to its proper degree by the finding of exactness in embouchure resulting from on-off practice. Understand as much as you can about the principles of muscle control and the way muscles work together. Try to know exactly what you are doing (puckering, tightening, pressure of mouthpiece). Pay attention to standards of performance. Do the notes speak immediately? Can you play both very loudly and very softly? Can you control intonation? Do attacks and slurs feel and sound completely secure? We are always presented with a choice in our way of hitting the notes. We are examining here not so much the notes themselves but the physical means that are used in making the note play. We have a choice of these physical means. Many muscles are involved and also many ingredients. The muscles in the lips and cheeks are either pulling, pushing, or supporting. Diaphragm, abdominal, and chest muscles are working in different directions, with the combined object of supporting the air stream. Muscles in the jaw move to make the interior of the mouth larger or smaller in size for low and high notes. The tongue must be considered. The invisible air itself is an extremely important ingredient. The nature of all practicing is to prepare one to be able to perform. The purpose of all practicing is to prepare for a better performance. Therefore practicing may be described as preparatory in nature. I believe that practicing should be divided into sections. Like calisthenics, warming up, during which emphasis is consciously given to correct muscular usage (diaphragm and face muscles). More like actual performing in that the player uses the warmed-up, educated muscles to put together studies, etudes, excerpts, solos, etc. This sequence imitates the situation of and prior to actual performance; i.e., warm up and then perform. What does it take to hit the right notes? Why are “easy” notes so often missed? There is a right way, at least a best way. And practicing that consists of watching only for the right note, instead for the right way of making the note, is in the long run wasteful and deceptive practicing. It is superficial to examine only the note itself and not to examine the method of production. A note that sounds secure when listened to casually may not feel secure and may in fact not be secure. If practicing does not lead to that feeling of security, the player will be inviting disaster during performance. It follows then that during practice the player should not merely be trying to hit the right notes, but should be trying to learn the best way of hitting them so they will be reliable. It is true in fact that only when that way is found and developed do the notes become secure and reliable. Too many players produce notes in a physically unwise manner. They do not realize the precariousness of their situation because while practicing they are judging only to see if they hit or miss notes. Hitting the note is their proof that they are approaching the instrument correctly and making logical physical efforts. They would be a good deal better off to be developing a correct system of playing even if during the development they miss more notes temporarily. A correct procedure, a correct physical approach leads to good results in all directions, not just in some directions. It may not lead to a spectacular and sudden improvement in any specific direction such as the addition of several notes to the high register (as might another approach), but it leads to uniformly excellent total picture of quality. Practicing should be a time when you are not trying to see how many notes you can hit in an hour. Rather, it is a time during which you should be preparing yourself to be able to play notes later when called upon to do so. Playing the concert in the warm-up room is not the way to assure doing it right on stage. Practicing should prepare you for the demands of a performance. Practicing is not, in itself, a performance. Tonguing, long tones, arpeggios, slurred thirds, etc. A certain amount of loud playing with open throat, diaphragm support, plus repeated tonguing of individual notes should find the best, most natural embouchure. When the throat is closed, the vibration is sometimes cut off unintentionally. The player in an effort to continue the vibration attempts to force the lips tightly together. A final result can be that the throat is too closed to permit the passage of air and the lips are too tense and tightened to permit a sustained vibration. The throat begins to try to play the high notes. Can the throat remain relaxed with the stomach muscles and diaphragm tense? One can slide all around the horn – up and down – without making any definitely noticeable lip changes at all. But this is a stupid procedure. Oo going down towards Ee going up, even though the Ee on the way up will be able to produce sounds on the way down. Studies are good that are built on well-known difficult solos using just two consecutive notes at a time (then three, etc.) so that the solo source is completely unrecognizable and suddenly surprises by appearing in original form. It is well worth taking the extra few minutes during warm-up to get the lips to feel right, to feel warmed up, not to just slowly go through a routine and pound most of the notes out whether the lips are feeling responsive and alert or not. To master the understanding and control of teeth, jaw movements, mouth size – and also to master lip and cheek alertness – is to master the horn technically. The lips must retain their tension to cooperate in the jaw’s efforts at closing for high notes and also (perhaps less) for opening for low notes. The alertness of lip and even the speed of a slur is best practiced on separate notes. Lip alertness is extremely quick to go. The short-pause attacks are an excellent way of making the lips stay awake and trying. This together with the correct changes in the size of mouth cavity is the correct combination. “Something” must be repeated again and again, always striving for perfection. But what exactly is the “something” to be practiced? One is either playing with a lip that has alertly formed the note or one is not. The lip cannot be both alert and asleep at the same time. The lip rarely sustains its alertness for long, especially in the first minutes of playing daily. The player should play notes that are only as long as the span of alertness. This means no slurs, long tones, or even consecutively played notes at first, but plenty of repeated short notes to take the place of long tones. The initial attack should be the moment of great alertness. Do not let the muscle alertness sag; however, the full sound is more important than that the note be extremely short. The note should last long enough for the muscles to try a bit. The time span is gradually lengthened to include long tones, slurs, and entire pieces. True endurance is built this way and not by playing a great deal on a non-alert lip. One of the simplest ways of examining the value of the practice of the separate notes is that the lips should learn the separate requirements for each note and then strive to copy exactly the same efforts in combined notes. Remember that daily beginnings are not just for so-called beginners; they are the daily beginnings for advanced and professional players also. We are all beginners as we start each day, but the experienced player relearns in thirty minutes what the inexperienced beginner takes months and years to learn. Start with one note and stay with it for a little while. Play it many times. Try to make it sound and feel secure, full and in time, and under control. Play it in a steady pattern of note, rest , note, rest. Does it speak at once? Try to play it a little louder until it is quite loud. Now a little softer each time. Not as softly as you can play, but a little softer each time until it suddenly will be as soft as you can play. The warm-up is the most important part of your daily practice. The goal is to make all of the physical ingredients familiar with their jobs in the production of each separate note when it is played with a strong controlled tone. You have the choice of proceeding over the whole range of the instrument, playing studies, for example, before the goal is achieved. That is step one. The rest follows logically. Next is combining notes into patterns (either tongued or legato), playing slowly or quickly, loudly or softly, or in a connected or widely leaping manner. 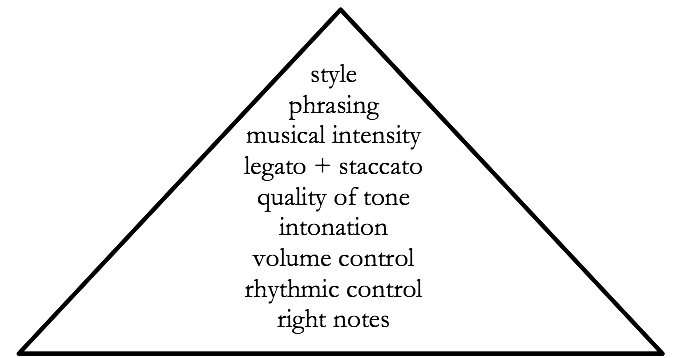 All these steps can be accomplished when a secure foundation of separated, strong notes is prepared. Even in ice skating or bicycling, in which a state of relaxed naturalness seems to be the secret in order to be able to glide about so effortlessly, one can see that the real truth is quite otherwise. The skater must assume a physical pose or a series of poses, an aware and quietly changing series of arrested movements, balancing his body in a learned position. Only then can his body help instead of preventing the blades and the ice to accomplish their wonderful duet of smoothly gliding movement. The skates are doing the skating and the body above is perceptively, sensitively, and intelligently staying out of the way. Sometimes directing, but always leaving the movement as something to be accomplished by ice and skates. The quality of this movement, be it in ice skating, a bow on a string, or the air being blown through a wind instrument determines the quality of the visible result. This quality of movement is a thing that is the result of the control of surrounding physical factors. This is like the movement called blowing on a wind instrument or like the bow on a string instrument. It is always inanimate objects that are coming together at the heart of the movement. Bow and string. Air and horn. Golf club and golf ball. This is why the blowing is all-important for winds and the bow arm for the strings. We must educate the muscles to do the blowing and the bowing so that they help and never interfere with the movement of inanimate objects. The art of the possible in working with musical instruments, golf clubs, or any other tool is in knowing how to relate our bodies to the dumb tools. Is the answer relaxation? Hardly. The other side of that coin is helplessness. Control is certainly not gained by giving up the idea of control. Art is artificial, not natural. Art is disciplined, alert, and intelligent. The injunction saying, “don’t try so hard, just relax” should be changed to, “try harder so that it will play.” To play well as a result of relaxation is to invite great nervousness. Mouthpiece practice provides a way of developing the utmost of independence within the embouchure itself. The horn is not being used to make the notes easier and the lips therefore have to shape and form and assume a pose that will play the notes with little pressure. To arrange the muscles for strength, we bring together as much muscle, supporting flesh and bone – everything toward one focal point of strength. Pucker because it brings muscles toward each other, instead of dividing them into weaker sections, like a fist, but avoid bringing so much together that it gets in the way. Don’t press too hard because this divides the mouth into two halves and restricts the freedom of muscular arrangement within the lips themselves. The mere fact that a note is being produced is no proof that it is being played with enough physical control. It is possibly being played with so little physical control that its existence might almost be termed “accidental.” Practice sudden attacks to force all the ingredients to meet at one moment. Intelligent players will view practicing as that time of preparation during which their muscles, singly and in combinations, are educated, reminded, and strengthened so that they will do their part to achieve performance goals. The ultimate goal of practice should be to develop and maintain physical control. Without physical control, you have no predictable degree of reliability in performance, and the attainment of virtuosity becomes impossible. Playing a musical instrument is in some ways as much a physical endeavor as is, say, golf. It is also as much a physical skill as, for example, carpentry or welding. The object of all learning efforts is to gain the ability to perform in a given situation. A lesson is a place to perform and to learn what good playing is. A student who understands what good playing is has already become his own teacher. Becoming your own teacher is a result of good teaching. Control is really the by-word. Practice should be measured with the same standards as actual performance. One problem in teaching is trying to explain to a student why he does not get better quickly and why he can’t benefit from simply playing through a lot of music. Knowing when to rest during practice might be considered as the “art of timing.” This “timing” is off when one doesn’t play regularly on a steady job. Resting and playing are equally positive and constructive acts. In Kopprasch #24, play each top note three or four times, alternating F and B-flat horns. In the Kopprasch #24 type of warm-up (in reverse low), the diaphragm should support the soft notes and the lips should feel as if they could play loud, but mainly the warming up should be done without the risk of blowing out the lips through forte. The “just right” way of hitting single notes is the way which you will be able to produce a satisfactory Kopprasch #24 (slurred, fast, etc.). But other ways (less correct, or more pressure, or not effortful enough by all the involved muscles) will not produce a successful Kopprasch #24, even though the single notes seem producible reliably. Kopprasch #24 then becomes a means of taking the supreme correctness of methods used to produce the isolated notes. Why practice after having passed the first stage? to perfect techniques; i.e., speed, legato, intonation, intervals, etc. After all, muscles are involved even in very relaxed playing. Even the lips, which merely act as a relaxed reed, are composed of muscle tissue and will show the results of exercise; for example, strengthening and becoming responsive to commands, and gaining familiarity with requirements. Routines can definitely help to bring the player up to a certain level. He must later know when to leave the routines if he wants to leave that level. To keep the embouchure in minimum shape play intervals daily. Work on range, close intervals, medium intervals (3rds and 4ths), large intervals, staggered directions, and consistent directions. Timed breaths and entrances on short and long tones to encourage deep, full breathing. The opening-out experience of the extreme low, some of which is retained into the high register, plus the demands on the full length of the air column. The lips gradually turn in only the necessary amount on ascending, and therefore avoid the dangerous “swallowing” of the lower lip (playing a scale from the very low to the top). The purpose of daily practice might be defined as giving strength, responsiveness, and intelligence to the muscles that surround and shape and control the size of the air hole, also the muscles that push and support the air. Practice therefore should be directed toward helping the “stupid” to “catch up.” This is done (stupid lips, etc. as compared to fingers) by copying that which caused the hands to develop so highly countless orders from the brain to accomplish a specific job; nothing moves without muscles. It is important to develop a method of using the tongue for the attack that does not interfere with or inhibit the proper functioning of the lips or the air stream. This is based on legato, which uses no tongue to which tongue is added; rather than a building of air (frequently too much air) behind a tongue rigidly interfering with air release. In other words, it is not the explosive action of the tongue that produces the note, but the correct control of lips and air. Security (accuracy) on the instrument comes finally from the successful and determined application of all of the various component parts of what goes to make up any particular system of playing. It is natural (therefore to be expected) that the correct lip arrangement will be harder to find on some days than others. This is a “memory lapse” of the flesh and other ingredients involved in the arrangement. On such days it is important that the player keep the lips relaxed and use good support while giving the arrangement a chance to correct itself. To some extent, the idea of moving a lot of air is nothing more than the sensation received when the diaphragm pushes the air against the resisting glottis; in other words, compression. If at the same time the lips are relaxed and in a good arrangement, the sensation and sound will be as though one is moving a lot of air. Without question, good sight reading is a byproduct of correct and well-established playing skills. Although other factors are involved (experience, quick thinking, good eyesight, etc. ), the primary reason for good reading is that the player is familiar enough with a workable system of playing. That is why it is foolish to practice reading before other playing problems are well solved and why sight reading might constitute a valid and fair test of a player’s ability. Instructional materials for students of musical instruments can be separated into two broad categories. The smaller of the two categories comprises books that attempt to explain how the thing is done. The how-to approach is theoretical in nature and may be described as an effort to instruct by means of analysis and logic. In its purest form, this kind of writing contains no musical material as such. It is either entirely verbal in context, or it is a mixture of verbal explication in conjunction with photographic or other nonmusical aids. The second broad category of instructional writing is musical material in the form of etudes, studies, exercises, warm-up routines, etc. In its purest form, the material in this category of instructional writing contains no non-musical material; i.e., no verbal instructions and no explanations of how to play, completely non-theoretical in nature. These works can be thought of as musical compositions into which are built various levels of performance difficulties. The educational purpose of these works is sometimes stated explicitly but more often it is only implied. The purpose is to present the student with the complete gamut of playing problems, musical as well as technical, in order to develop and test his readiness to perform real music. The distinction between study material and real music is one that is recognized and accepted generally, and most musicians consider it to be self-evident; however, some of these works can be thought of as real music, and they are doubly valuable in that they present playing problems in a beautiful and musically satisfying form. Very few works can be cited as examples of purely theoretical writing. On the other hand, many authors can be cited as composers of non-theoretical (purely musical) writing whose works are directed primarily toward music education; Kopprasch, Gallay, Kling, and Schuller are examples. The underlying rationale implicit in the use of this kind of material is that people can learn by doing. A further implication (often stated explicitly) is that explanations and theoretical analysis are largely a waste of time. Some studies are needed that are limited as to range but still provide interesting solutions to musical and mechanical problems. These may be helpful to players of limited range in that something is provided for practice material that does not exceed the high or low note capacities of their particular stage of development. Etudes within an octave are good for beginners; some advanced type of studies could be used as a warm-up emphasizing the low range as a starting point and encompassing most of the purposes of my present warm up. The playing of studies is helpful and important. Such practice sets up graded problems for the player to solve. It provides self-test material to prove out production problems that the player thinks he has solved. It tests and builds endurance and also provides melodic interest and rhythmic experience. However, no number of studies will teach the player how to play or how to practice. Many students end up being little more than collectors of music that they can’t play, that they don’t know how to play, and that they don’t know how to practice. Is your problem insufficient understanding of the how of playing? That is, are you unclear about the mechanical production? Or are you simply ignorant about how to practice each day so that at the end of a proper warm-up, you end up with a lip that is either tired or still unresponsive? One of the benefits of long tones is that they teach one how to keep blowing after one thinks all the air is gone; i.e., they bring the diaphragm support into play. This can also be achieved by playing many separate notes without breathing. Studies give one a way to combine notes in different combinations after a proper warm-up has been accomplished. They help prepare hornists for solo passages in the literature.